I simply loved the flavor of this dosa because it is not just plain but loaded with vegetables and nuts. Enough spiced so that it tastes good just without any chutney. Although I paired it with coconut ginger chutney. 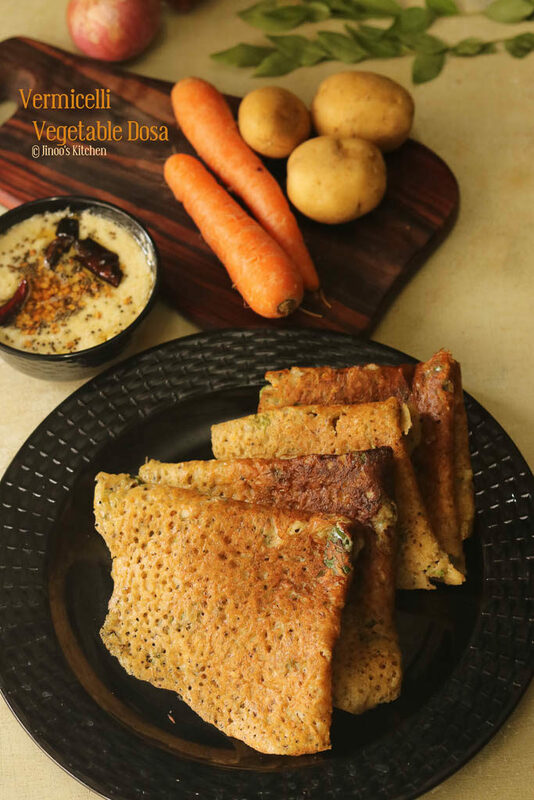 After making the very regular instant dosa varieties like Wheat Rava dosa, Tomato dosa, I was planning to try something different but easy and healthy. This is a.k.a Semiya Kaikari dosai having vegetables in it. I have added only potatoes, carrots and onions in it. But in case you want to try a different flavor too – add a tomato while grinding all the vegetables. When I read this recipe in a cookbook, I was wondering how the raw potato paste would taste along with semiya in dosa but trust me I will give it a 5-star rating! Grind everything given under “To make coarse powder” without adding water to a coarse powder. Grind everything given under “To make a fine paste” with little water to a fine paste. In a large bowl, mix semolina, vermicelli, rice flour, wheat flour, and salt. To this mix, add coarse nuts powder and vegetable paste that we have prepared. Add 1-1.5 cups water and let it sit for 30 minutes. After 30 minutes, prepare the tempering. Heat oil and crackle mustard seeds, cumin seeds, urad dal, curry leaves, and asafoetida. Mix well and add more water to bring it to rava dosa batter consistency. 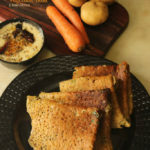 Prepare the dosa tawa and pour in a cup of batter wide. spread oil all over. Turn sides and cook on both sides until brown and crisp. 1.Take roasted vermicelli and roasted rava in a bowl along with rice flour and wheat flour. 3. Now, lets prepare the nuts spice powder. For which, In another bowl, take cashews, almonds. 4. Along with it, add pistachios and peppercorns. Grind it coarsely. 5. Meanwhile, Also grind this vegetables to a paste. Grind it raw. Take 1 onion, 1 small carrot, 1 small potato, ginger and green chilli. 6. Blend everything together until smooth. You can also add tomato for added flavor. 7. Add this vegetable puree to the semiya flour mix along with the nuts powder. 8. Add water little at a time and mix well. Close and let it rest for at least 30 minutes so that the vermicelli and nuts gets softened. 9. Meanwhile, In another pan, heat coconut oil and crackle mustard seeds, urad dal and cumin seeds. Also add broken curry leaves and asafoetida a pinch. Mix well and add the tempering to the batter. 9. Add chopped coriander leaves and more water to make it to a thin consistency. Thin than the regular dosa. Mix well. 10. Prepare the dosa tawa and use a bowl to pour the batter over the prepared pan Like we make for rava dosa. Also note that if you make it thick like regular dosa batter, then you can spread it like we do for normal dosa. Apply oil all over the sides and center. 11. Turn sides and cook till crispy and brown. Cook in medium heat. Fold and serve. 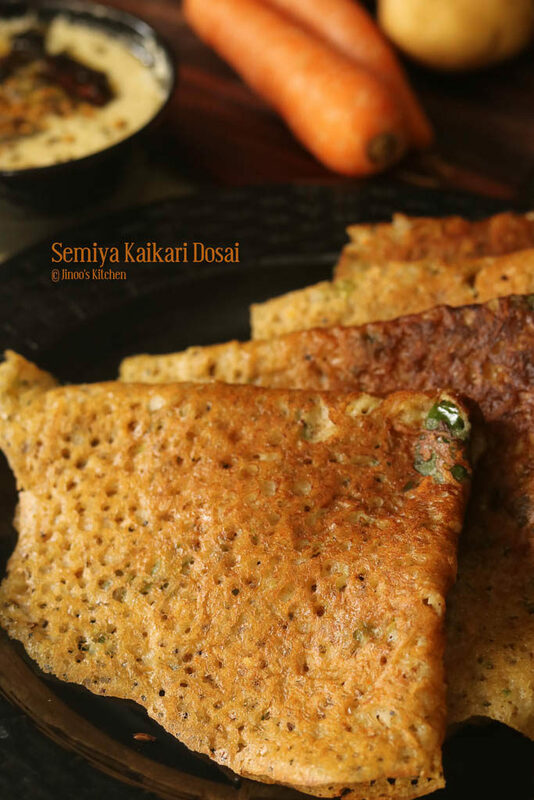 Serve the semiya dosai hot and fresh with coconut chutney or idli podi.